Mitsuki was originally from another village, the Village of the Hidden Sound. But since meeting with Boruto and the others, Mitsuki has decided that he will now remain at the Village of the Hidden Leaf and become a ninja. 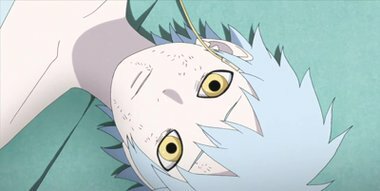 In the past, Mitsuki has had his memory taken away from him, and had lost his identity, along with what he wants to achieve in life, only to awaken in an unfamiliar laboratory. The mystery that surrounds Mitsuki, and the plethora of thoughts that surround him, has now cleared up for him.